While the rest of the country goes back to school, bundles up, and prepares for the onslaught of all things pumpkin, it’s still a million (okay, 90+) degrees here in southern California. Ugh. The thought of turning on my oven this week made me cringe, so I opted for a no-fuss, cool treat instead. 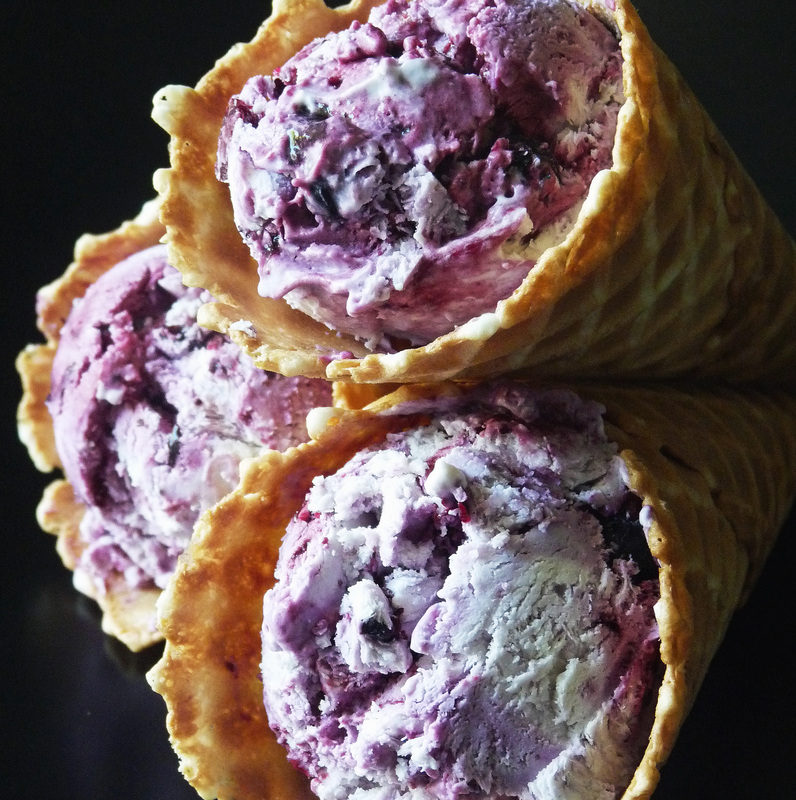 Behold the glory of Blueberry Cheesecake Ice Cream! The best part of this recipe – originally featured on Pastry Affair, one of the most beautiful food blogs on the Internet – is that it doesn’t require an ice cream maker, or any fancy tools except a hand or standing mixer. It’s also incredibly easy – a great option for those who’d like to make their own ice cream, but are intimidated by the process of cooking crème anglaise. The result is a rich, creamy dessert bursting with blueberry deliciousness. I ate all three cones in this photo, if that’s any indication of its amazing flavor. Make, enjoy, and bring on the Fall! In a small saucepan over medium-high heat, cook blueberries and granulated sugar until berries burst and release their juices (approximately 5-10 minutes). Add the cornstarch to thicken and continue cooking for another 1 to 2 minutes. Remove from heat and place blueberries in the freezer to cool quickly (approximately 15 minutes). In a plastic container, spread half the whipped cream. Top with half the blueberries. Spread the remaining cream and top with the remaining blueberries. Using a knife, swirl the ice cream. Cover and place in the freezer for at least 6 hours. Serve in waffle cones, if desired.